General Contractor: Herr & Co.
Weiler Orthodontics is located in Harrisonburg, Virginia. Dr. Weiler inherited an existing space and aesthetic from his predecessor and had a thriving business. His business had grown to a point that he wanted to make the space match his vision for client care. He approached our firm along with Herr & Co. with the challenge. Our goal was to create a space that was comfortable for his patients, typically teenagers, while infusing his personality into the design. The other challenge was to achieve a condensed construction schedule to minimize the impacts on Dr. Weiler’s client services. Our firm pulled together a design through renderings, materials pallets, and construction drawings to allow Dr. Weiler to see his vision and for Herr & Co. to start planning for construction. Our design also addressed comfort issues in the space which we solved through a new insulation strategy and HVAC system designed by Suter Engineering. 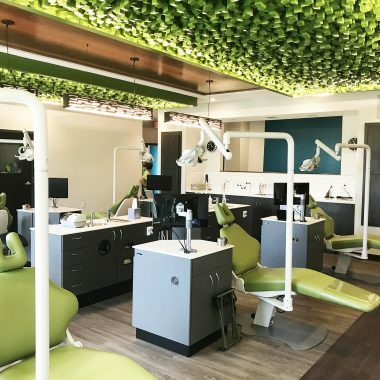 This comprehensive remodel shows how to create a comfortable and sophisticated space that increases client satisfaction while reinforcing your brand. The space is fresh, clean, and comfortable bringing smiles to our client and his clients! Blog posts about the process.